Article by Florienne Loder, Communications and Engagement Advisor at Bio21 Molecular Science and Biotechnology Institute. The Bio21 Molecular Science and Biotechnology Institute, or ‘Bio21’ for short, has a powerful founding vision, which is inherent in its name: a molecular science and biotechnology institute. It is a community of brilliant scientists, equipped with the most cutting-edge instrumentation, working together to improve human health and the environment through innovation in biotechnology and molecular sciences, driven by multidisciplinary research and dynamic interactions with industry. In 2017 Professor Michael Parker took up the challenge as the new Director of leading the Institute into an exciting future, located in one of the great biomedical precincts in the world. “Bio21 is not the ‘cancer’ centre, the ‘brain’, ‘infectious diseases’ or ‘sustainability’ institute; yet individual groups do conduct research in all these fields. From understanding how malaria invades the body, to what makes mozzarella cheese stretchy, or how organisms can adapt to climate change – the common denominator is the molecular science approach we all use to seek knowledge and solutions to problems in health and disease, environment and agriculture and more generally the biological sciences. We are the ‘molecular sciences’ institute!” says Michael Parker. Bio21 is uniquely positioned with large, state-of-the-art technology to delve deeply into the structure and nature of molecules, from small molecules, to peptides, proteins, nucleic acids and viruses. The Bio21 Institute was built with collaboration in mind. The architects built bridges across the atrium with break-out spaces to meet and chat. The Institute is home to groups across the three STEMM faculties of the University of Melbourne (Science; Medicine Dentistry and Health Sciences and the Melbourne School of Engineering). The Bio21 community also includes industry members, CSL Ltd, Prana Biotech Ltd, Circa Group and more recently, Rhythm Biosciences and SYNthesis Research & Med Chem. One strategy that has served Bio21 researchers well is to truly seek to work collaboratively with colleagues within and across disciplines, in academia and industry. Bio21’s success is reflected in a Nature Index survey of leading research institutions in Australia, where the Bio21 Institute figures prominently (see BioMedVic Nature Index infographic). There are numerous examples within the Institute of collaboration that has led to truly innovative commercialisation successes, such as: Spencer William’s success with Fibrotech; Clarity Pharmaceuticals commercialisation of radiopharmaceuticals; Barnham and Donnelly labs commercialisation and licencing of a motor neurone disease drug with Collaborative Medicinal Development Pty Ltd (CMD); and collaborative work between Takeda Pharmaceuticals and the Tilley lab to show that proteasome-inhibiting cancer drugs can be repurposed to be effective against malaria. These great stories highlight the biotechnology aspirations of Bio21. At the end of 2018, Bio21 celebrated the opening of the Nancy Millis building and Margaret Sheil Mass Spectrometry Laboratories. It is founded on collaboration between CSL and the University of Melbourne and now houses CSL research groups as well as Platform Technology facilities from the University of Melbourne. Bio21’s collaborations, span the Melbourne Biomedical Precinct and beyond, contributing to our success as a world class molecular science and biotechnology Institute. Bio21 is co-located with industry tenants. In 2018, the Bio21 Institute welcomed Rhythm Biosciences (diagnostics), and SYNthesis med chem (medical chemistry), two biotechnology companies, that moved into the Bio21 Business Incubator building (building 404). They join CSL (biological therapeutics), Circa Group (chemistry of bio-derived products) and Prana Biotech (medicinal chemistry applied to neurodegenerative diseases) as industry research groups who are part of the Bio21 community. From the beginning, it has been one of Bio21’s goals to support translation and commercialisation of research and to provide a supportive ‘incubator’ space for industry research, whether they be start-ups or more well established companies. Bio21 is an attractive location for industry groups for many reasons: access to our platform technology facilities, being embedded in a thriving academic research institute and in close proximity to other University of Melbourne institutes and faculties, medical research institutes and hospitals in the Melbourne Biomedical Precinct in Parkville. But, it is often the intangible factors such as a collegial, collaborative and welcoming research culture that then leads to the flourishing of these groups in the Institute, as well as the growth of opportunities for all. The Bio21 research environment consists of well-resourced platform technology facilities that house powerful research instruments. Some of our facilities represent the largest of their kind in Australia, with cutting edge instruments and led by highly regarded national experts in their respective technologies. Much of the instrumentation has been supported through government grants, such as the ARC LIEF grants. Bio21 has been likened to Dr Who’s ‘Tardis’; small on the outside but full of amazing technology inside. The Margaret Sheil laboratories in the Nancy Millis building house the Melbourne Mass Spectrometry and Proteomics platform and Metabolomics Australia platform, with a total of over 30 mass spectrometers. Melbourne Mass Spectrometry and Proteomics, with its fleet of eight mass spectrometers and seven HPLC instruments, as well as sample preparation instruments makes it possible to conduct proteomic, lipidomic and metabolomics analyses of samples, as a powerful way to identify biomarkers of diseases, as well as measure the impact of potential therapeutic candidates. A recent addition to the laboratories, through a collaboration with the Doherty Institute, is an ICP-mass spectrometer that can identify metal ions at very low concentrations in biological samples. The Metabolomics Australia facility, also housed in the Margaret Sheil laboratories at Bio21, comprises the combination of high-throughput analytical technologies for the detection and quantification of metabolites in biological systems with the application of sophisticated bioinformatic tools for data mining and analysis. The most commonly used platforms for the detection and measurement of metabolites involves the use of gas chromatography, liquid chromatography, or capillary electrophoresis coupled with mass spectrometry. These analyses can be very powerful for biomedical and environmental research. The Melbourne Magnetic Resonance platform is home to nine magnetic resonance spectrometers, with a tenth one on the way for fragment-screening purposes. This suite of instruments includes 400, 500, 600, 700 and 800 MHz magnetic resonance spectrometers and a DNP solid-state dynamic nuclear polarization-enhanced NMR system to make increasingly sensitive measurements of samples from small molecules through to large proteins, in solution, but also as solids in more physiological conditions. The Melbourne Advanced Microscopy platform is bursting at the seams with high end electron microscopes. It is housing four TEMs, amongst which 3 cryo TEMs. It is also equipped with 2 SEMs and a dual beam microscope. The ThermoFisher FEI Talos Artica cryo EM has already led to a number of atomic resolution protein structures despite only being commissioned a year ago. Bio21 looks forward to new cutting edge technology in 2020 with the arrival of a 300 keV cryo EM and cryo FIB instrument for tomography allowing imaging of structures in their native environment. 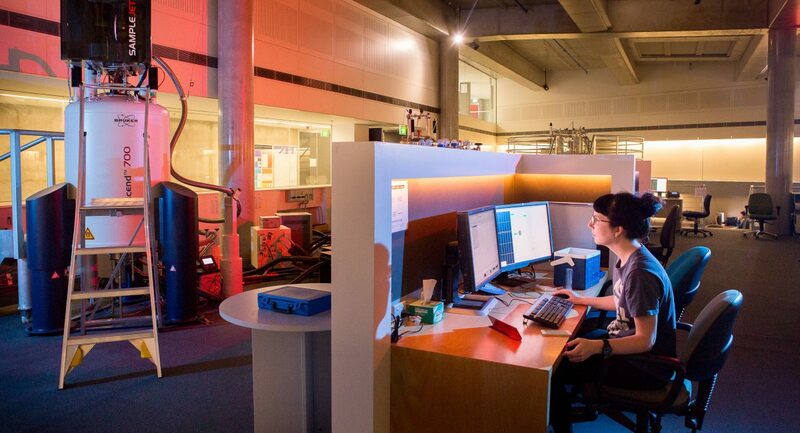 The Bio21 Institute also has several high end optical microscopes with confocal microscopes and super resolution systems as well as sample preparation equipment as part of the University of Melbourne’s Biological Optical Microscopy Platform (BOMP). A new facility will be built to house the electron microscopes and will provide much needed space and the opportunity for further expansion. Bio21’s Melbourne Protein Characterisation (MPC), which is currently being established, will be a key resource within Bio21 for studying protein function and interactions as well as supporting the other platforms through the production of well characterised proteins for further analysis. The platform which is nearing completion in April, will be comprised of three facilities, to support protein discovery research: 1. Protein Production, 2. Protein Characterisation and Interaction and 3. X-ray diffraction. Protein Production will focus on insect and mammalian cell protein expression and is so far equipped with a Biostat twin control tower with rocker and cross-flow system. The Protein Characterisation and Interaction facility contains analytical ultracentrifuges, fluorescence spectrophotometers, UV-Vis absorbance spectrophotometers, isothermal titration calorimeters, circular dichroism spectrometers, dynamic light scattering zetasizer, biolayer interferometer, microscale thermophoresis, and differential scanning calorimeter. The facility will soon be complemented by Biacore surface plasmon resonance with funds from the recent successful ACRF grant. The X-ray Diffraction lab has been fitted out with a Rigaku Synergy-S X-ray diffractometer for both protein and small molecule studies and a PX Scanner. A suite of protein crystallisation robots will be added over the next year. The major Bio21 platforms are supported by the Bio21 Systems and Computational Biology Platform and the Melbourne (Bio21) Specialist Store. The former has recently set up “Bio21 cluster 1”, a high performance cpu cluster with a total of 340 cpu core to support our platforms and researchers at Bio21. The ‘Bio21 precinct’ is growing its facilities. With the ‘Stage 2C’ development to house CryoEM microscopes in the former Veterinary Research Institute and the newly established Melbourne Protein Characterisation platform, Bio21 is growing our already significant molecular science instrumentation capacity. The Bio21 Institute is a wonderful environment to undertake molecular science research, equipped with a suite of platform technology facilities. It is however, the combination of these complementary technologies: for example, metabolomics using Magnetic Resonance and Mass Spectrometry; X-ray crystallography in combination with CryoEM and computational biology that often give us that extra insight, resolution, detail and data that allow us to solve the missing pieces in our respective puzzles. Complementing each other the instruments housed in Bio21’s platform facilities, are an incredible resource to the biomedical scientific community within the Melbourne Biomedical Precinct. Peter Hickey majored in Mathematics and Statistics from the University of Melbourne in 2009. Up until UROP, he was not sure about where his Bachelor’s degree would lead him. Ten years after his UROP placement, Peter reflects on what it meant for him and how UROP influenced his career. Why did you apply for the UROP program? A university friend had just done a UROP placement and said it was great, so I decided to apply. The fact that it was a paid placement was also very important for me, because I was supporting myself through university. Also, getting paid for your work makes you feel valued. At that stage I wasn’t sure about what I wanted to do. In fact, I nearly didn’t even go to university at all. I was considering studying music or joining the police force. I only started Mathematics and Statistics at university after a family friend encouraged me to. And although I was enjoying my degree, I didn’t really know what I would do with it at the end. It was thanks to UROP that this changed! How was your UROP experience? I did my UROP placement at the Walter and Eliza Hall Institute (WEHI). As soon as I started I was immediately working on a real project, mapping genes that were involved in rare Mendelian diseases and trying to understand what mutation in the genome was causing the diseases. I really appreciated that it wasn’t a toy problem, it was a real dataset, which made it very exciting and relevant. But I had quite a bit to learn when I started! I was a Maths and Stats undergrad, so my Biology and Genetics knowledge was rather limited. I taught myself some concepts and I also received a lot of help from my lab colleagues. Most of them were from a similar background to me, so it was a great environment because we had a comparable process of learning. the most important element for a great placement. How was the relationship with your supervisor? My relationship with Melanie Bahlo was fantastic. Melanie was very happy for me to knock on her door and have a chat whenever I got stuck – which happened a lot when I started! She understood that I wasn’t used to working with high-performance computing and was very patient and supportive. I appreciated that she took a lot of time to involve me in the the project but also in the whole lab so that I felt part of the research group. Since my UROP placement, Melanie has continued to play a very important role in my career and today is still a mentor of mine. What was a highlight of your UROP experience? At the end of my UROP I went to the 7th GeneMappers Conference in the Blue Mountains. I had never been to a scientific conference to present my results, so it was an amazing experience to conclude my placement. Another highlight during my placement was the chance I got to present my results to clinicians, neurologists and people from other backgrounds, which gave me a priceless experience in explaining statistical research to non-statistical scientists. How has UROP influenced your scientific career? Doing UROP meant that now I have a scientific career. If it weren’t for my placement, I don’t think I would be doing research today. UROP was very influential and a real pathway for me. My placement was so successful that I decided to stay in that lab and do honours in Statistics with Melanie. I then went on to do a PhD, also at WEHI. After my PhD, I moved to the US for a post-doc position at the Johns Hopkins University, in Baltimore, where I spent two and a half years working in a great environment, professionally and socially. After my time at the Johns Hopkins University I came back to Melbourne. Nowadays I work at WEHI in a service role within a multidisciplinary team where I can move between Statistics and Biology, a combination I started to discover during my UROP placement as an undergrad. What do you think is the key to a successful UROP placement? In my opinion, the key for a successful placement is having a good supervisor. In any lab there is a lot to learn so students need someone who is willing to dedicate some hours answering questions and guiding them. The supervisor-student relationship is, for me, the most important element for a great placement. Would you like to become a UROP supervisor? I would love to have a UROP student one day, it would be a way of paying it forward. I would like to give the same opportunity I had to a new person. And I would be inclusive, meaning that I would want to bring into research more women, minority groups from Australia and people from non-scientific families. I don’t have a lot of power to change the whole system but supervising UROP students can be good way to contribute to make science more inclusive. Read more about the Undergraduate Research Opportunities Program (UROP) here. On 18-20 June 2019, the Lowitja Institute International Indigenous Health and Wellbeing Conference will take place on Darwin, Australia. The Conference will be an Indigenous space built on First Nations knowledges and values, where the Lowitja Institute will promote a conversation about the futures that Indigenous people want. BioMedVic celebrates the Conference and is excited to see its amazing draft program, which includes a speaker line-up with Marcia Langton, Tahu Kukutai, Abhay Bang, and many more. Note that Earlybird registration closes on 29 March 2019! Veski is calling for applications for two of its programs. Applications close 2.00pm AEST on Thursday, 18 April 2019. Find application details on the websites for Leading the Way and Stamina. Innovators are encouraged to send their applications for the final two spots of the 2019 veski fast smarts. In total, nine people will be part of this curated showcase of Melbourne’s brightest innovators. Veski will deliver its third and final veski fast smarts on 22nd May 2019. You can find more information here. The National Health and Medical Research Council (NHMRC) 2018 Research Excellence Awards were recently announced in Canberra. These Awards recognise “excellence in the health and medical research sector by celebrating individual achievements, leadership and the exceptional contributions of Australian researchers to their fields of research”. Professor Patrick McGorry AO (University of Melbourne) – Research Fellowship. This award is given to the highest ranked applicant in NHMRC’s Research Fellowship scheme. Professor Peter Choong (University of Melbourne, St. Vincent’s Hospital Melbourne) – Practitioner Fellowship. This award is given to the highest ranked applicant in NHMRC’s Practitioner Fellowship scheme. BioMedVic warmly congratulates these and all recipients of the NHMRC 2018 Research Excellence Awards. UROP Call for Projects: Refer and You Shall Receive! UROP is now accepting projects! More information for supervisors here. If you are (or have been) a UROP Supervisor, you can benefit from this offer! Because you know the benefits of having a UROP scholar in the lab, why not share this opportunity with your colleagues? You just need to refer another researcher to become a UROP Supervisor, and you will receive a $50 cinema voucher! (Terms and conditions apply). Supervisors must include the name and contact email of their referrer in the project form. The referrer can be both a current or a former UROP Supervisor. To be eligible to receive a voucher, the match between the Supervisor and the UROP Scholar must have been confirmed by BioMedVic and the student must have commenced the placement. The Prime Minister’s Prizes recognise Australian scientists, innovators and science educators for outstanding achievements in scientific research, research-based innovation and excellence in science teaching. There are five Science Prizes and two Science Teaching prizes. Each prize recipient receives a medallion, lapel pin, prize money and an award certificate. Applications close 12 March 2019. See the eligibility criteria and more information about the nomination and assessment process here. Prime Minister’s Prize for Science is awarded for a significant advancement of knowledge through science. Prize money of $250,000 is awarded to the recipients. Prime Minister’s Prize for Innovation is awarded for the innovative translation of scientific knowledge into a commercially available product, service or process that has had economic, social and where relevant environmental benefits. Prize money of $250,000 is awarded to the recipients. Malcolm McIntosh Prize for Physical Scientist of the Year and Frank Fenner Prize for Life Scientist of the Year each recognise an exceptional achievement in science that benefits, or has the potential to benefit, human welfare or society. Prize money of $50,000 is awarded to the recipients. Prize for New Innovators recognises an exceptional early achievement towards partial or full commercialisation of scientific research with substantial economic, social and where relevant environmental benefits. Prize money of $50,000 is awarded to the recipients. Prime Minister’s Prize for Excellence in Science Teaching in Secondary Schools — Prize money of $50,000 is awarded to the recipient. The Australian Institute for Musculoskeletal Science (AIMSS) is a collaborative institute for translational research into ageing and musculoskeletal (MSK) diseases. Investigating disorders of bone and muscle as well as the interactions between muscle and bone and factors that control MSK health, AIMSS is having a major impact on MSK research worldwide. AIMSS has established an important collaboration with ANSTO’s Australian Synchrotron (AS)* that enables the institute to use a wide range of enhanced imaging and resolution techniques to delve into the structure and function of the MSK system and search for better therapies and approaches to address conditions such as osteoporosis, osteopenia and sarcopenia. These studies are especially important in the context of Australia’s ageing population, which is a key driver of the Institute’s goal to improve health outcomes via evidence-based research in both the basic sciences and in the clinic. One of the projects that AIMSS is currently researching at the AS uses a highly specialised X-ray tomography approach, unique to the AS, to study the long-term bone and muscle changes seen in osteopenia and sarcopenia, as well as osteoporosis. Other collaborative projects are using X-ray fluorescence microscopy to study the side-effects of oxaliplatin therapy in cancer and changes in bones and muscles associated with inflammation-induced osteosarcopenia in a preclinical model of inflammatory bowel disease (IBD), a condition that affects approximately 75,000 people in Australia. These projects and others are overseen at AIMSS by Prof Gustavo Duque, A/Prof Kulmira Nurgali and other AIMSS Project Directors, and are being facilitated and coordinated by A/Prof Damian Myers, the Program Director for Basic Sciences and for Medical Imaging at AIMSS. * The Australian Synchrotron is a national facility administered under the Australian Nuclear Science and Technology Organisation (ANSTO). The Synchrotron’s diverse range of beamlines offers Australian researchers powerful imaging modalities that, previously, were available only through synchrotrons in Europe, Japan and the USA. For more information, contact A/Prof Damian Myers (damianem@unimelb.edu.au). High-definition mapping of trace metal distribution at the neuronal network level. 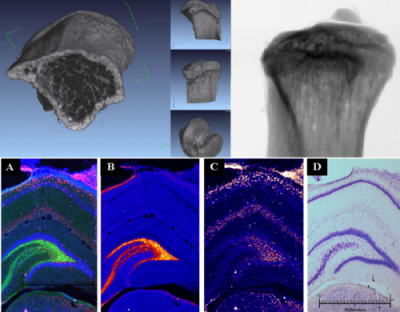 Spatial map of hippocampus region of rodent brain depicting zinc, iron and copper (Panel A: Zn=Green; Fe = Blue; Cu=Red; Panel B: Red to highlight CA3 region of HC; Panel C: Highlight of Cu distribution; Panel D: Thionin staining showing Nissl bodies in neurons). This work was funded by the TAC under the Victorian Neurotrauma Initiative (CIs TJ O’Brien, DE Myers and RJ Hicks) and other contributors to this work included Prof Vivienne Bouilleret, Ms Lisa Cardamone, Mr John Williams, Dr Nigel Jones and several students who worked on that project at the time. Myers DE, Stevenson AW, Wilkins SW, O’Brien TJ, Hicks RG, Mayo S, Maksimenko A, Moorhead GF, Ryan CG, James S, Broadhead ML, Patterson D., de Jong MD, Howard D, Häusermann D. X-Radiation in Health and Disease: Novel Approaches to the Study of Disease Processes and Therapy. Proceedings, 40th Annual Condensed Matter and Materials Meeting (2-5 Feb 2016). Wagga Wagga, NSW, Australia TA1: 1-11. Australian Journal of Physics. See paper. The 2019 UROP Welcome Forum was held on Valentine’s Day in a celebration of our love for science! The new cohort of UROP Scholars, potential future candidates, current and past supervisors, and the BioMedVic team gathered on the iconic Melbourne Town Hall Portico to welcome the new UROPs and officially open the first round of 2019. Two excellent keynote speakers inspired the audience with their UROP-related talks. Both presenters were former UROP scholars whose accomplishments since their placements have been impressive to say the least! First up was Dr Avnika Ruparelia, from the Australian Regenerative Medicine Institute (ARMI) at Monash University. Now a UROP supervisor, Avnika talked about her UROP placement, the key learnings from that time, and gave some useful tips to the current students. Avnika was followed by Dr Peter Hickey, from the Walter and Eliza Hall Institute of Medical Research (WEHI). Peter shared his research journey, the decisions he made along the way, and finally gave some thoughtful advice to current and future UROPs about undertaking a scientific career. The keynote speeches were followed by a round of Q&A, which led to the liveliest part of the event, a guided networking activity. Sticking with the Valentine’s Day theme, this year’s networking activity might better be described as “UROP Speed-dating”. The Portico was abuzz as students met one another and many new colleagues, each enthusiastically sharing their research interests (see this short video as evidence!). On behalf of BioMedVic, Núria Saladié expressed sincere gratitude to UROP’s Principal Sponsor, CSL, who was represented on the day by Dr Marthe D’Ombrain, Director of Research Innovation. Marthe spoke about CSL, her scientific career and shared encouraging words about UROP and the opportunities the program provides to Scholars. Marthe also presented the new UROP cohort with their certificates and lapel badges. All agreed that the 2019 UROP Welcome Forum was a resounding success! Avnika, Peter and Marthe’s speeches stimulated the audience with insights about UROP, about careers in research and about innovation in Australia and beyond. Their inspiration was tangible during the lively networking activities, leaving no one in any doubt that “Science was in the air” this Valentine’s Day in Melbourne. Thank you to everyone who attended and contributed to make the 2019 UROP Welcome Forum such a memorable event. A program of Biomedical Research Victoria, UROP is an employment scheme that places undergraduate students in research labs in Victorian universities, research institutes, hospitals and industry. Students accepted into UROP come from diverse education backgrounds including biomedical science, chemistry, computational science, maths and engineering. BioMedVic custom-matches eligible students with research experiences to the benefit of both parties. Since 2004, BioMedVic has placed almost 700 UROP Scholars. See more information on UROP here. 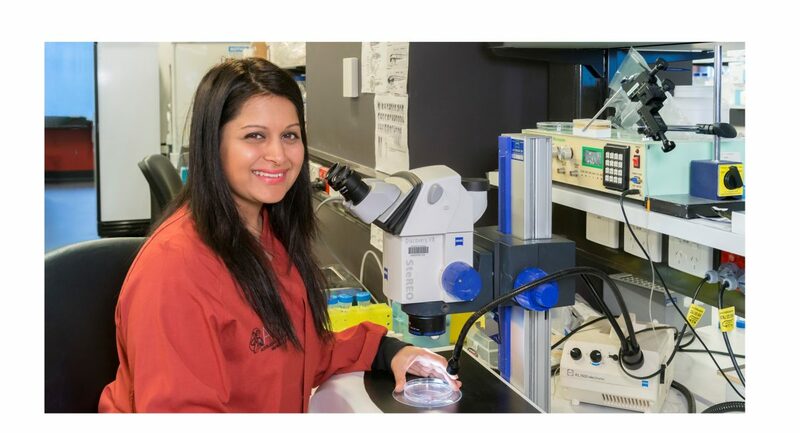 Avnika Ruparelia is a Research Fellow in the Currie Group at the Australian Regenerative Medicine Institute (ARMI). She did her UROP placement in 2009 also at ARMI, where she discovered the zebra fish model for muscle disease. Ten years later, Avnika has become a UROP supervisor to give back all that she got from her experience. Read Avnika’s research journey and how UROP played its part. When I was first placed at ARMI, I didn’t know what I would be doing and knew nothing about zebra fish. During my UROP experience with Associate Professor Robert Bryson-Richardson and Professor Peter Currie, I discovered not only that I liked research, but that I was passionate about it. My work during the placement set the foundations for my PhD, and therefore, for what I am doing right now as a post-doc. My UROP experience definitely shaped my scientific career! You have been a student and now you are a supervisor. What made you decide to take on a UROP student? I wanted to give back what I got. I had seen the benefits of UROP, so I wanted to make it possible for somebody else and give them their first research experience in a lab. Also, because I had a great supervisor I now want to become that person for a new student. Who knows, maybe in ten years from now, this student will speak about me in the same way I speak about my supervisor! What would you say is the value of UROP for students? UROP gives students a real insight of what research is all about. In undergrad prac classes, all experiments are set up to work towards the expected outcomes, but that’s not a true representation of reality… Most of the time, it’s the other way around! UROP students get exposed to real lab work and learn how to tackle failure, which is a key learning for any career. The UROP placement also is a great opportunity for students to test the waters and see if research is something they feel passionate about and want to pursue further. I had seen the benefits of UROP, so I wanted to make it possible for somebody else. And what would you say is the value of UROP for supervisors? Students bring in fresh ideas! When we have been in the lab for some time, we get used to following protocols blindly or we forget to ask the simple questions about our own research. For supervisors, it is fantastic to have someone asking “why do we do this like this?” as it helps us reflect on our work. And of course, an extra pair of hands to help move the research forward is always welcome and appreciated. What do you think is key to being a good supervisor? I believe supervisors should take the time to teach and train their students, remembering what they were like the first time they entered a lab and how much they knew. Good supervisors should be able to put themselves in the students’ shoes and understand their position, without negative judgement.